CF™640R is a rhodamine-based far-red fluorescent dye with excitation and emission maxima very similar to those of Cy®5 and Alexa Fluor® 647 (Figure 1). CF™640R is much brighter than Cy®5 and at least as bright as Alexa Fluor® 647 (Figure 2). A major advantage of CF™640R over Cy®5 and Alexa Fluor® 647 is its exceptional photostability. Cy®5 and Alexa Fluor® 647 are cyanine-based dyes and, like other cyanine dyes in general, have intrinsically poor photostability. CF™640R is also superior to ATTO™ 647N, another spectrally similar dye frequently used in single-molecule imaging. As shown in Figures 2 and 3, CF™640R is significantly brighter and more photostable than the ATTO™ dye. The combination of excellent brightness and photostability makes CF™640R ideal for confocal microscopy, single- molecule imaging and other demanding applications based on fluorescence detection. A full selection of reactive dyes, secondary antibodies, antibody labeling kits, and other bioconjugates including phalloidins, Annexin V and α-bungarotoxin are available for CF™ dyes. Figure 1. 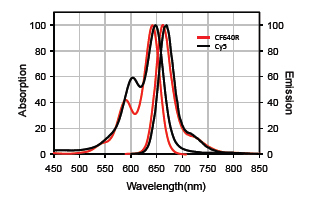 Absorption and emission spectra of CF™640R and Cy®5 conjugated to goat anti-mouse IgG in PBS. Figure 2. 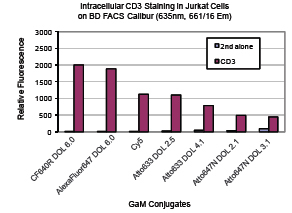 Jurkat cells were stained with intracellular CD3 followed by goat anti-mouse IgG conjugates. Background staining was determined by secondary antibody staining alone. Fluorescence was analyzed on a BD FACS Calibur in the FL4 channel. The bars represent the relative fluorescence of the geometric means of the population of cells. Figure 3. 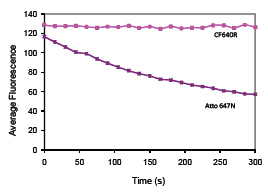 Photostability comparison between CF™640R and ATTO™647N, a far-red dye frequently used in single-molecule imaging. Dye solutions at 0.5 mM in PBS were continuously exposed using a Cy®5 filter set on a mercury arc lamp microscope. Images were captured every 15 seconds, and mean fluorescence intensity of each image was calculated using Image Pro Express software.